What’s the deal with Millennial family travel? If that sounds like the opening to a “Seinfeld” episode, well, it’s probably because I’m a Gen-Xer. As a father to two teenage daughters, I’m well-aware of the Millennial generation. These travelers are looking for authentic, immersive experiences they can instantly share with friends and family via their social media channels. 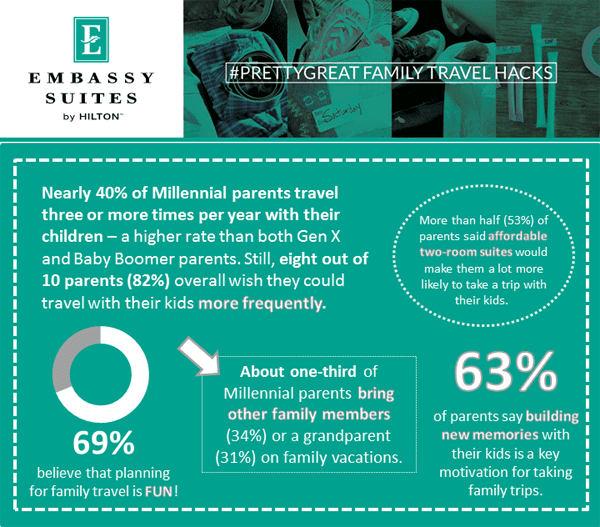 But are Millennial family travelers really all that different than anyone else? An ethnically diverse population of 84 million, Millennials are currently between the ages of 18 and 36, half with their own children, according to Jeffrey Eslinger of D.K. Shifflet and Associates. Eslinger added, “Millennials are rapidly reshaping the family travel landscape, and currently account for 31 percent of all U.S. travel with children.” Millennial family travelers with annual household incomes above $50,000 spend more ($5,749 per year) and travel more (average of 5.4 trips) than most in the industry assume, said Steve Cohen, who offered a sneak peak of the 2016 “MMGY Global Portrait of the American Travelers.” A recent survey commissioned by Embassy Suites by Hilton also found that Millennial parents travel with children at higher rates than both Gen-X and Baby Boomer parents, and nearly 70% of Millennial families enjoy the trip planning process, heavily relying on user reviews online, travel blogs, and personal recommendations from friends and family. Millennial families want to experience something new when they travel, and they want to go behind-the-scenes and understand places in depth. Not only do Millennial parents want to sample a region’s cuisine, they want to help prepare it in a hands-on workshop side-by-side with their children. Millennials want to be actively engaged in a meaningful way, such as zip-lining over a Costa Rican cloud forest, whitewater rafting on the Colorado River through the Grand Canyon, or learning a number from a Broadway show. Meeting new people ranks much higher as a motivator than other generations, underscoring the personal focus that will certainly be passed on to their own children. Millennial family travelers rely on smartphones and 78 percent have booked a travel service with an app in the past year notes Jeremy Crider, manager, public relations for Trivago.com, the hotel metasearch engine. Of course, the ubiquitous smartphone is also used for photos and “selfies” shared on their social media channels, but Ed Tapan, Head of Industry, Travel, at Google said the “me” aspects of the Millennial profile are no different than those ascribed to Boomers and Gen-X travelers when they were in their youth. I certainly have many photo albums filled with pictures of myself in my twenties posed in front of notable travel landmarks. I just didn’t have the means to share them with anyone except those who could see my printed photos. When traveling, Millennial families look forward to family bonding, fun, and building new memories with their kids is a key motivation for taking these family trips. That’s the take-home message, and again no different than the motivators for Boomers and Gen-X families to take their family vacations. All young families, whether they were Boomers, Gen-Xers, or now Millennials are looking for affordable ways to share experiences together. With their two-room suites, free breakfast, and evening reception included, our family has always found Embassy Suites by Hilton a good value during our travels, and provides the comfortable home base to diminish stress, allow us to relax, enjoy, and absorb the new places, people, and activities surrounding us during our family adventure. In addition to travel-writing at Adventures by Daddy, I have served as a guest writer for a number of different sites, and my articles have appeared on USA Today Travel, Fox News, Huffington Post, MiniTime, Parade Magazine, and Yahoo Travel, to name a few. This post was written on behalf of TBEX sponsor, Embassy Suites.